Whoa!!!! Don’t pack your favourite Vango camping kit away just yet. Camping isn’t just a fun way to spend your weekends in the glorious summer sunshine. At Vango we also love camping adventures in the winter. We aren’t that mad…. I promise. So wrap up warm, sip some hot chocolate, put your feet up by the fire and enjoy our top tips for winter camping. Before heading out on your winter camping trip make sure you are aware of what you might face as you will be exposed to everything that Mother Nature may throw at you. Utilise the internet, call the camp site for advice, review camping forums and seek the knowledge of fellow campers to gain as much information on your planned trip location. What to expect from the terrain? When does the sun-set and rise? Is there dry firewood available? Once you have you done your initial research you are now able to pack appropriately for your adventure. When packing make sure you take all the necessities and then some, being prepared will make the difference between experiencing a miserable trip, and having a great time in the outdoors. When getting ready make sure you layer up! This is the best method to keep you warm, however if you get to hot you can easily take off a layer! Start with a base layer top and trousers (long johns) and thick socks. Then a pair of hiking trousers and micro fleece or softshell jacket, followed by waterproof jacket or bottoms to keep you dry. If it is particularly cold opt for a down or insulated jacket. Finally make sure you have a good set of water proof walking shoes to keep your toes warm and your feet protected. Make sure that your Rucksack or Daypack is good enough to keep all your belongings dry, and is big enough to hold your additional supplies. A Dry Bag or Dry Sack would be a great option when venturing out on a wet, or potential showery day to protect all your belongings from the wet conditions. Tent - The majority of Vango tents use our Protex® 70 denier polyester flysheet. These have a hydrostatic head (HH) of 3000mm (This is the measurement of how water resistant your tent material is) meaning Vango tents are highly waterproof, durable and reliable against the rain. However if you want a little extra protection, our family Elite Airbeam Tents have a HH 5000mm fabric. For those of you planning on winter mountain hiking check out our Trekking tents which are light weight and extremely durable against the elements which have a 6000mm HH. A footprint sheet will act as an additional layer for insulation and protect your tent from dirt and stones, further prolonging its life. Sleeping Essentials - An appropriate seasonal Sleeping Bag is extremely important in keeping you safe and warm while you are idly asleep. Make sure you take a 3-4 season bag preferably mummy shaped, which will sit closer to the skin and prevent heat loss. 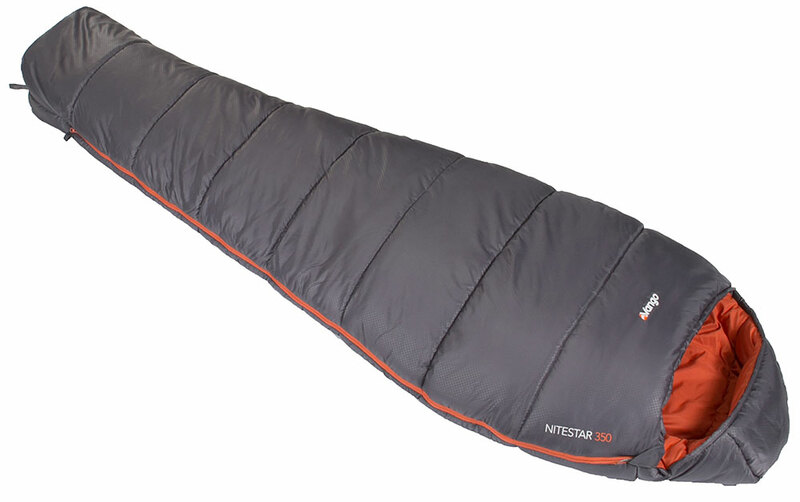 The Vango Nitestar 450 is a great bag for winter camping. A sleeping bag liner makes another great addition not just for keeping your sleeping bag clean but as another layer of warmth. Sleep Mats will provide insulation between you and the ground. Elevating yourself off the cold ground is extremely important to stop you becoming too cold. It is a good idea to take a self-inflating mattress (SIM) and trekking mat as a double layer of insulation between the ground and you. If you are staying near your car, take an extra blanket or two as a backup, in case the weather is colder than forecasted. However if venturing further afield it may be a good idea to sleep in insulated clothing which will provide another layer of protection. Lighting - As the late nights draw in it will be dark both in the morning and early in the evening. Make sure you have a trusty lamp and/or torch so you can make your way around your campsite. Vango offers a full range of lighting options from head torches keeping both your hands free, to lanterns. 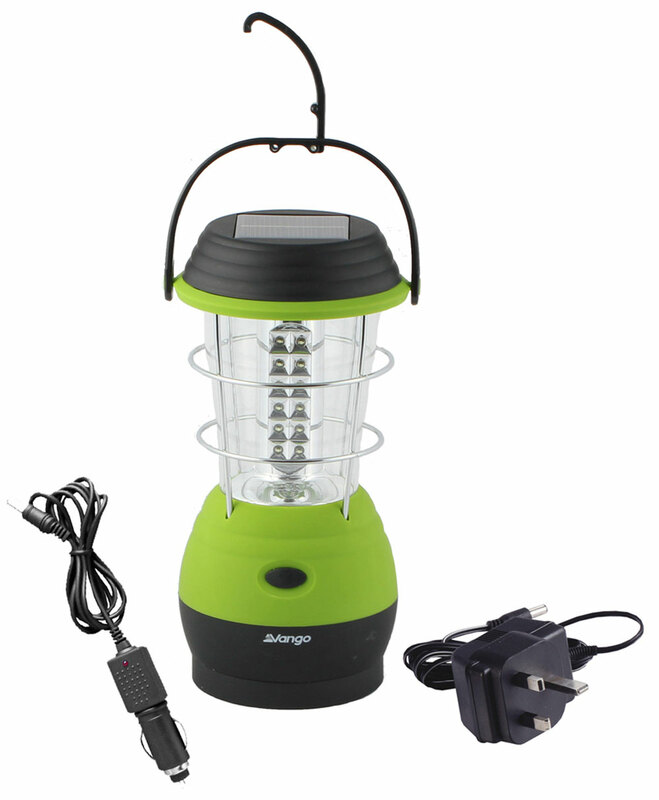 One of our most popular lanterns is the Eco 36LED Dynamo Lantern which can be charged using your car, winding it up or with solar panels making it an extremely reliable lantern. Though, if you do use a lantern or torch which requires batteries remember to pack spares. Food and Cooking - High energy snacks such as nuts and chocolate are not only tasty but will fuel your body and keep you warm. However make sure you have hot meals available, Wayfayrer meals are flavoursome camping meals that are highly nutritional and will heat you up after a cold day. There is a wide range of Wayfayrer breakfast, dinner and dessert options and they can be eaten both cold and warm however we recommend you eat your meal when it is warm. To cook your camping nosh you will need a reliable cook kit. We offer lots of different sizes of cook kits which can all be easily be packed away, making them extremely portable. Fire - Make sure you have dry wood and that it is stored in an environment which will keep it dry, otherwise you may not be able to build a fire. An ignitor which will not be damaged by water is also important. The Vango Firestarter is a great option as it won’t become damaged from the elements. We hope that you find our winter camping tips useful. All you have to do now is plan your winter trip, get prepared, wrap up warm and get out there. There is many great adventures to be had in the great outdoors throughout the colder months. Tell us where you are planning to camp this winter and, if you have any additional tips feel free to add them to the comments below.